The 2019 Ascent is set to arrive in stores in late June. McMINNVILLE, Ore. — When production of the Subaru Tribeca ended in January 2014, the automaker was left without a three-row crossover just as that segment was heating up. Subaru customers didn't seem to mind. The brand's U.S. sales grew by more than half over the next four years without the product, to 647,956 vehicles last year. It’s been a similar surge in Canada, where the automaker sold 55,570 vehicles in 2017, up from the 42,035 vehicles it sold in 2014. But Subaru executives and retailers have made it clear that it was a problem needing to be fixed. By not offering a three-row crossover, Subaru owners with families were leaving the brand as soon as they outgrew their current model. Four years later, Subaru has finally plugged the hole with the 2019 Ascent. It will be sold only in the U.S. and Canada. The Ascent, set to land in Subaru stores in late June, is the largest model the automaker has ever designed. It is expected to have a sales volume of around 60,000 units per year in the U.S. It didn't say how many it expects to sell in Canada. 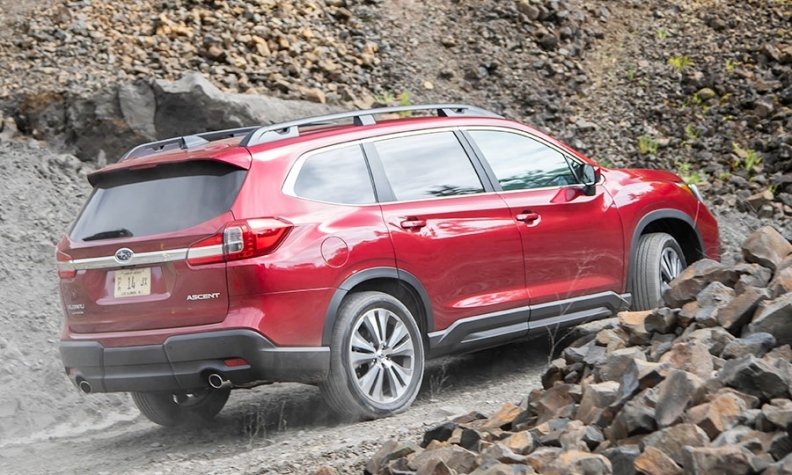 When it came to the Ascent's exterior design, Yasunori Kumagai, Ascent project general manager, said that a clear focus for the new nameplate was "to have a sense of scale and presence to exceed the Outback." The crossover can seat seven or eight occupants, depending on the trim. The base trim comes with a second-row bench seat, while Premium and Limited trims offer optional captain's chairs. The range-topping Touring comes only with captain's chairs. Peter Tenn, car line planning manager, said during the Ascent's media introduction here, the seating selection mix probably will be 70 per cent captain's chairs and 30 per cent bench. Also important during the Ascent's development was ensuring that the crossover would be able to handle American sized cargo. "It's made for Americans and we were keenly aware of that," Tenn said. "We made sure that it can accommodate the things that Americans take with them." This meant testing the design on how well it could fit such items as baby strollers, "American-sized" coolers and child seats. "We sent all that stuff to Japan so that Mr. Kumagai and his team could make sure it really fit those things and that people could really use those things," Tenn said. Subaru baked in a number of multipurpose features throughout the Ascent that are aimed at making occupants' lives simpler. This includes bullet train-inspired grab handles on the second row that allow for easier access to the third row and that also function as hooks for backpacks or grocery bags; spill-repellent cloth upholstery; and 19 cup holders. "We know that not everyone is going to have 19 cups in the vehicle, but the nice thing is that kids will find their own things to put in there," Tenn said. "We really wanted everybody to have their own personal spaces to store things, whether it's their toy cars and fidget spinners. Or if you go to the beach and your kid wants to put his shell collection there, everybody will find the space that they need in the Ascent." If there was a tag line for the target customer for the Ascent, Tenn said, it would be "Everyday adventure family." The expected median customer age is in the mid-40s and it skews slightly more female, he noted. "These are really busy people, always on the go," Tenn said. "Music classes for the kids, sports, going out as a family, taking road trips. The vehicle is designed to do all of that." The Ascent's four trims will be base, Premium, Limited and Touring. Limited is expected to be the volume-selling trim. By contrast, Premium is the volume trim for most nameplates in the Subaru portfolio, a spokesman noted. Said Tenn: "We're attracting a new customer, a more affluent customer. They tend to gravitate to the higher trims."